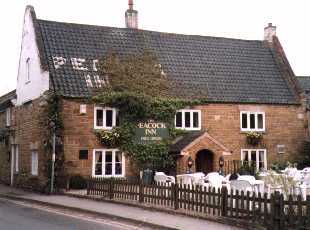 The Peacock Inn is one of two fine pubs in the pretty Leicestershire village of Redmile. The oldest part of the Inn was built in 1704 and belonged, as did most things in those days, to the Duke of Rutland. It has been a focal point of village life for many years and most locals will remember the large dance hall which stood to the rear and doubled as a cinema and in which many famous names such as Georgie Fame, Acker Bilk and George Melly, appeared during the sixties. Prior to that it had been used during the war for the storage of coal shipped to the village along the still navigable canal – indeed, the former gun emplacement may still be seen in the car park. Having fallen into disrepair, the hall was demolished in 1987 when Colin Crawford, the current owner, took over the inn. Since then, the business has expanded to include a popular restaurant and, with the closure of the adjacent garage, an extension offering eight rooms of accommodation. Colin says he is very much looking forward to the reopening of the canal and has plans to provide moorings for hungry and thirsty boaters. He adds that restoration is breathing new life into the village, in terms of the improving wildlife habitat and the attraction to walkers and anglers as well as boaters. He has great hopes that this “wasted amenity” will be returned to a working canal for the enjoyment of everyone for many generations to come.